They have to be tough ocean plants to dwell on the west coast in the South Island of New Zealand. These rugged coastal plants have to withstand prevailing winds, seaspray, and cold conditions to survive. When I came across these pretty ocean plants which are such delicate little bell flowers, I could see that they would make a fabulous foreground in the picture. 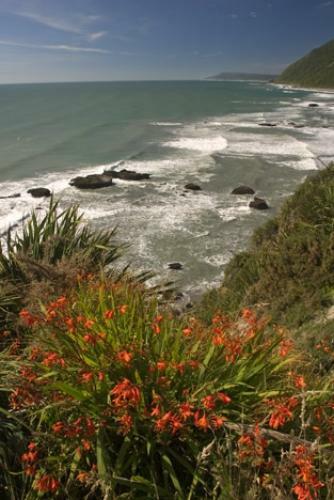 With the vibrant red set against the natural green and the ocean colours these oceans plants were perfectly positioned.